Meatloaf, traditionally made with ground beef or a mix of ground beef, pork and veal, is often too high in fat and sodium to be considered healthy. However, you can make this dish at home using healthier ingredients to turn this comforting -- but typically unhealthy -- dish into one that is nutritious enough to include in your diet occasionally. Order meatloaf at a restaurant, and you could wind up consuming 480 calories before you even touch the sides included in your meal. The typical beef meatloaf contains about 232 to 330 calories per 4-ounce serving, depending on the type of ground beef used, so if you watch your serving size, you can stay within your recommended calories for the day. Making your meatloaf with ground turkey, chicken or bison can also lower the calories in the dish. A 4-ounce serving of meatloaf made with lean ground turkey has about 255 calories. One of the main drawbacks to the typical meatloaf is the high fat content. A 4-ounce serving of meatloaf made with ground beef has about 14 to 21 grams of fat, and the same amount of turkey meatloaf has about 9 grams. Fat should make up no more than 35 percent of your calories each day, which means you shouldn't consume more than 78 grams of fat if you eat 2,000 calories per day or 58 grams of fat if you eat 1,500 calories per day. Restaurant versions of meatloaf are often loaded with sodium, with a typical portion containing about 1,090 milligrams out of the recommended limit of 2,300 milligrams for healthy people. People with high blood pressure or an increased risk for heart disease shouldn't get more than 1,500 milligrams of sodium per day. Making your meatloaf at home can help you decrease the sodium, especially if you use herbs and spices to flavor the dish instead of salt. For example, a recipe that includes ketchup but no added salt has about 273 milligrams of sodium. Meatloaf isn't all bad. If you make it using oatmeal and nonstarchy vegetables as well as meat, it provides a bit of fiber, with the amount depending on the ingredients added. 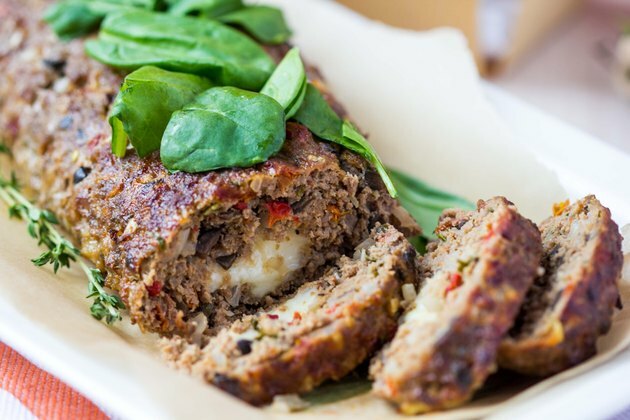 A typical meatloaf has about 12 to 17 percent of the daily value for iron per 4-ounce serving, as well as about 20 percent of the DV for phosphorus and 28 percent of the DV for vitamin B-12. You need iron and vitamin B-12 for forming red blood cells, and phosphorus is essential for strong bones.